JUST IN, OUR FASTEST ELECTRIC STAND UP LIFT EVER WITH DIGITAL BATTERY DISPLAY AND EMERGENCY LOWERING BUTTON, ON SALE TODAY!!! The SA400E is the 400-lb capacity version of the updated Stella Stand Assist Lift. Featuring all new electronics, actuators and battery systems, the SA400 series is designed for secure patient transfers and caregiver convenience just like it's predecessor the Stella Lift. The BestStand Sit-To-Stand patient lift allows a caregiver to lift and transfer a patient safely with minimum physical effort. For caregiver convenience, the lift can be operated with the included hand pendant/control, or by the soft-touch up/down buttons located on the control box. With it's 3" front casters the SA400E provides smooth maneuverability and a low base height of 4.7" for clearance under beds. This Stand-Up style lift is easier to use than most standard Patient Lifts for transfers to wheelchair, bed or commode. The Stand-Up style Lift requires the patient to get into a sitting position on the side of the bed. 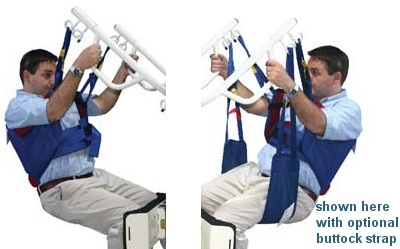 Unlike standard Hoyer/Patient lifts, the Stand-Up Lift cannot lift the patient from a lying position. Model SA400E: Sit-to-Stand Lift w/400-lb weight capacity, single battery pack. Model SA400E-D: Sit-to-Stand Lift w/400-lb weight capacity, extra battery pack and wall-mount charger. 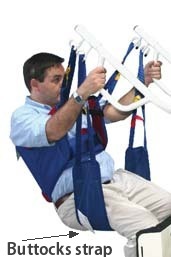 When used with the unique Bestcare deluxe sling, it provides unparalleled comfort and safety. Extra sling loops on the lift mast allow the Stella Lift to double as a commode lift for increased flexibility. The Stella style Lift is the ultimate solution for worry free patient transfers between bed, chair or commode. Designed to significantly reduce manual patient lifting. This lift should be used solely for transferring a patient from one object (beds, bathtubs, toilets, etc.) to another. Secure and safe for both users and caregivers. Quick and easy access to cleaning and changing. Doubles as a commode lift for additional flexibility. Lumbar and underarm pads provide maximum comfort as this sling will not ride up. Use with our Sit-to-Stand Lifts or to replace uncomfortable competitive slings. For those that require some additional initial lift assistance an optional buttocks strap attachment is available. The buttocks strap can be used as a transport sling. Smart charging function for longer battery life. Battery capacity indicator on battery pack. Soft start and stop for lifting actuator. Soft and Hardware over-current protection. Actuator’s Over-duty protection with alert on LCD display. Emergency stop button interrupts the power supply to the actuators and makes the actuators stop immediately in case of sudden danger. Control panel with two buttons. Audible alarm for low battery capacity. 3" front casters provide low base height of 4.7"
The BestStand Series of sit-to-stand patient lifts provide a solution for patient transfers between bed, chair or commode. The BestStand Series of patient lifts reduces injury risk associated with antiquated manual patient lifting practices. Competitively priced and combined with a unique design, the BestStand Series of sit-to-stand patient lifts provide a new level of comfort and safety. 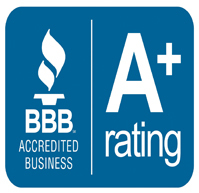 The BestStand lift has set the standard for value for both residential and facility use. 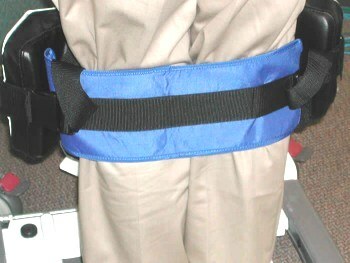 This Buttocks Strap works with the standard Stella sling for those that require some additional initial lift assistance. The Buttocks Strap is a simple sling the patient sits in. Generally used for patient transport in a Standup Lift. The optional Knee-Strap helps hold patient's knees against knee pads. This is helpful with patients that do not have control of feet or legs and will keep their feet on the footboard. Attachment points on the SA400 knee pad for connecting this strap.